Posh midfielder Gwion Edwards tries to get away from Woking's former Posh defender Nathan Ralph. Photo: Joe Dent/theposh.com. Peterborough United came perilously close to marking the anniversary of one of their greatest results in knockout football with one of their worst. Liverpool came to London Road on December 3, 1991 for a Rumbelows Cup tie and luckily they brought Bruce Grobbelaar with them enabling Posh to enjoy a triumphant 1-0 win. Posh defender Ryan Tafazolli (left) opens the scoring for Posh at Woking. Photo: Joe Dent/theposh.com. Twenty-six years on and Posh were the giants in a second round cup tie at National League Woking. They would also have been ‘killed’, but for some heroics by goalkeeper Jonathan Bond who saved a first-half penalty and produced a fine close-range stop in injury time. Shocks do happen in the FA Cup, and several League One clubs have been despatched by allegedly lesser outfits already this season, but the facts behind this most fortunate of draws make for worrying reading from a Posh point of view. This wasn’t one of those afternoons when the underdogs got in the faces of more talented opponents and took advantage of a bad pitch and awful weather conditions by playing an effective brand of hoofball in the hope of riding their luck to victory. Oh no, conditions were nigh on perfect in Surrey. The pitch was flat, there was no rain, no wind and very few long balls were seen, even though Woking had an Akinfenwa-type centre forward in Inih Effiong. Woking weren’t lucky either. In fact they were most unfortunate not to have sole possession of a numbered ball in tonight’s (December 4) third round draw. The non-league team, who are not yet a full-time club, outplayed Posh by keeping the ball on the deck, by passing more accurately and by bringing their talented wingers into play as often as possible, particularly Joe Ward who gave poor Posh right-back Alex Penny a torrid afternoon. 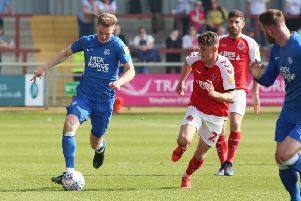 Posh managed none of the above despite manager Grant McCann fielding the same starting line-up that impressed at Charlton, before a late panic attack, in their previous outing. McCann was surprisingly upbeat after the game considering the sheer awfulness of his side’s lethargic display, pointing out the level of fatigue that comes with playing regular midweek matches, while praising his side’s spirit and workrate. Sadly those qualities weren’t enough to avoid yet another Tuesday fixture. But chairman Darragh MacAnthony was less bothered about sparing some feelings. He might well have been suffering from jetlag after touching down from his Orlando base a few hours before kick off, but his irritability was still completely understandable. Free admission to the replay for all fans who suffered through a tortuous 90 minutes was his instant reaction - it’s not guaranteed the near-700 who made the trip will feel there’s sufficient value in the offer. Posh started slowly and even the boost of a 24th minute goal for Ryan Tafazolli after home ‘keeper Nathan Baxter had parried Jack Marriott’s header into his path failed to galvanise them. Predictably a Marcus Maddison set piece delivery set up the goal and it’s just as well Posh have that wand of a left foot on their side as they failed to test Baxter again before the final whistle. Posh seemed content to sit back and coast to a 1-0 win, a dangerous tactic against talented opponents with skill and pace on each flank and a brute of a centre forward. For the most part Tafazolli and Steven Taylor repelled all incursions into the Posh penalty area with great skill and commitment, but Bond still snatched the man-of-the-match award. His save from Chez Isaac’s well-placed penalty five minutes before the break after Penny had hauled Effiong to the ground (he must be a strong lad to manage that) was obviously a key moment as was his reaction-stop to thwart former Posh midfielder Kane Ferdinand from close range in the final minute. With the last kick of the game Bond was beaten, by a deep Ward cross that thudded against the crossbar. No-one could have begrudged Woking a second goal. Ward had equalised after a moment of Keystone Kops madness from the Posh defence six minutes from time. Andrew Hughes and Tafazolli both wasted chances to clear effectively before a left-wing cross reached Ward and he smashed home from eight yards despite hobbling on one leg at the time. “We had mixed emotions after the game,” Woking’s impressive young manager Anthony Limbrick admitted. “It’s a great result on paper and to equalise so late was pleasing, but we dominated the match and we really should have won. McCann’s reaction to Woking scoring was to withdraw the dashing Edwards and replace him with a centre-back. It seemed like an acceptance of a terrible performance and a desire just to get out of town alive, while hoping for a better day in the replay. Posh were awful - but not this bad - against Tranmere in their original first round tie before romping to a 5-0 replay win. Posh will need to conjure up some of the spirit and ability of Chris Turner’s 1991-92 side to have any chance of that happening again. Posh: Jonathan Bond, Alex Penny, Andrew Hughes, Steven Taylor, Ryan Tafazolli, Anthony Grant, Chris Forrester, Gwion Edwards (sub Jack Baldwin, 85 mins), Marcus Maddison, Leo Da Silva Lopes, Jack Marriott. Unused substitutes: Ricky Miller, Jermaine Anderson, Danny Lloyd, Conor O’Malley, Michael Doughty, Idris Kanu. Woking: Nathan Baxter, Louis Ramsey (sub Matt Young, 63 mins), Joey Jones, Jordan Wynter, Nathan Ralph, Chez Isaac, Kane Ferdinand, Charlie Carter (sub Jamie Philpot,74 mins), Regan Charles-Cook, Joe Ward, Inih Effiong. Unused substitutes: Jason Banton, Fabio Saraiva, Joshua Staunton, Sam Mason, Declan Appau. Goals: Posh - Tafazolli (24 mins). Woking - Ward (84 mins). Cautions: Posh - Marriott (foul).